When you mix the fat wallet of Mercedes with the creative genius behind Garia, a company whose sole business is producing luxury carts, you get somewhat of a novelty item that you just don’t want to say no to. Be it a Hummer cart, of a Porsche cart, Mercedes has the one up on all those companies by creating something that doesn’t look like the typical Mercedes, but has the essence and all the traditional luxury trim you would come to expect of the brand. The folks over at Mercedes has had this idea for the least 3 years. 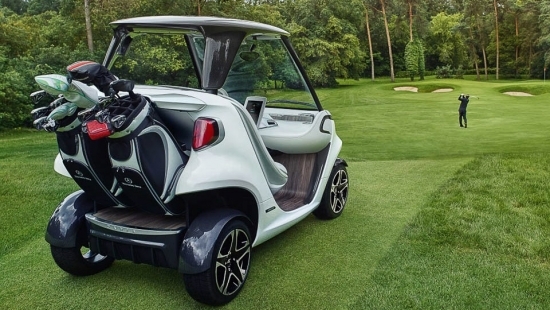 Designing and collaborating with Garia allowed the company to produce a concept cart which they recently debuted. Mercedes and Garia went to great lengths to make a golf cart that doesn’t look like a golf car. They wanted to change the way golfers looked and used the cart. No longer is it just a transit vehicle to get from hole to hole. This car makes a statement with it’s lowered ride height and simplistic yet elegant body lines. Hop inside and you’ll be greeted with all the goodies you would find in the carts bigger siblings. Occupants sit on a curved bench seat which also plays dual role as a fridge to hold those oh so important beverages while you are on the green. The dash is trimmed in carbon fiber, as is the rest of the interior to create that luxury and performance feel. Tech package includes a full infotainment system. And don’t worry about getting around the entire 18 holes as the cart has a full range of 50 miles. The Mercedes/Garia partnership cart is not slated for production. Only two concept vehicles will be built to go on shows and gauge buyer interest. 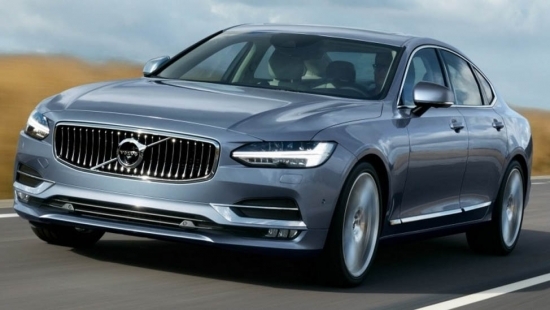 Volvo’s S90 is a new entry in their lineup and will take direct aim at the premium large sedan market putting the BMW 5 series and Mercedes-Benz E class right in its crosshairs. The released images from Volvo looks promising with the flagship sedan shown to be loaded with high-end luxury equipment. The S90 will be equipped with Volvo’s City Safety collision avoidance system which has been upgraded and offers large animal detection – a first of its kind on the market. When the system detects the presence of a large animal it immediately initiates brake support to avoid a crash. Volvo’s new luxury sedan will also feature a semi-autonomous driving technology that keeps the car driving within its lanes by providing steering assistance at speeds up to 130 kph even if there is no car in front. Along with the standard gas drivetrain, customers who are looking for the extra mileage can opt for the plug-in hybrid drivetrain. Motor Monday: What Does Luxury Even Mean? When I was a teenager there was a distinct difference between a Ford Taurus and a BMW 3-series. Heated seats, heated mirrors, dual-zone climate control… 50% more money was buying you features exclusive to brands known for their luxury. Features that you wouldn’t find in any similarly priced Domestic or Japanese vehicle, let alone something cheaper. Now you can find yourself picking out features in a Kia that aren’t in a more expensive Mercedes. Does this mean Kia is now a luxury brand? Does it mean Mercedes isn’t? I think most people would disagree with both. Maybe they should think harder. It used to be easy to identify luxury, there were tangible things you could point to and say “You’ll only find this in a high-end car”. What do you point at now? The line between luxury brands and “other” brands is all but gone. Today’s Hyundai has a comparable interior to a BMW for less money. Styling? I’ll take an Accord over a C-class for exterior looks any day, and Hyundai poaching Peter Schreyer from Audi has been a significant part of their recent success. Performance? Well luxury brands have never really had a lock on that. I’ve cherry picked a couple examples here but the fact is I could list off a lot more, which isn’t something I could say 10 or 15 years ago. There is no longer something you can touch or see that distinguishes a luxury brand from anybody else. So why are the Germans still luxury brands and the Koreans aren’t? Well, cliche warning, it seems to be the badge. The Koreans and Americans have been doing some aggressive marketing to try and change peoples’ perception and let the public know “Hey, we make really great cars now, please get over yourself and come drive one”, and I hope it works. Of course, it took nearly a decade of making really good cars for Hyundai to shed its garbage image and become a legitimate contender, I’m not holding my breath for Joe Public to elevate them further. Not that this perception problem is limited to non-enthusiasts. Hell, car guys hold some of the strongest and wrongest opinions of all. These guys will have one bad car and swear off the brand for life, as if that makes any sense (Full disclosure: I will never buy another Mazda for, uh, totally dissimilar reasons. *cough*). One generation will have a publicized issue so they assume every generation is bad. One car their cousin owned will have a problem so the whole brand gets a bad image because of it. Windsor would be impressed by all the salt that flows on the Beyond forums because people take a single, usually second hand, anecdote as irrefutable evidence of WHATEVER THEY WANT. This is a car for the 1% of the 1%. 99.9% people need not apply. It’s likely to be close to $400K here in Canada. You can still buy a nice condo for that kind of money. 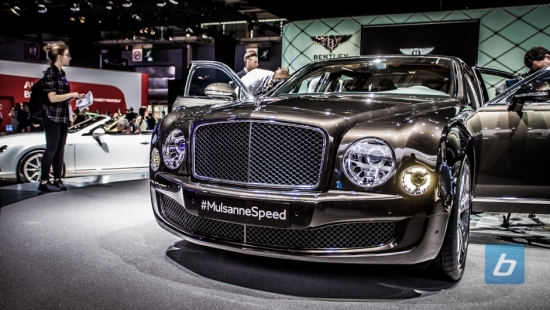 But for the Uber rich where $400K is chump change, the Mulsanne Speed is a nice daily commuter. The 6.75 L V8 churns out a respectable 530 hp and makes the 6000 lbs car capable of going 330 km/h (190 mph). Blacked out chrome and some exhaust tip changes are really the only things you might notice that are different from the regular and mundane Mulsanne. The interior is faboulous. Any surface that can be covered in quilted leather has quilted leather. The interior ooozes luxury. The crazy thing about this massive car is that it only seats 4. The middle seat in the back is fully of audio controls, usb ports and the all important wine glass holder. Cause you know, if you are rich and being driven around, you have to be sporting Champagne. As with all Bentley’s, everything is handmade and bespoke. You want something special? You have to pay. But what is an extra $40K when you are spending $400K? Anyway, enjoy our small gallery of unobtanium from the Paris Motor show. A long time ago, Infiniti had a car called the Q45 that was the flagship of the Infiniti line. 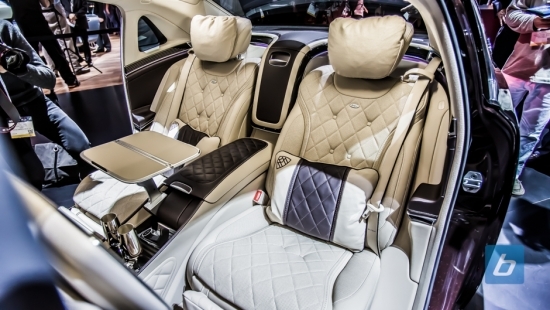 It was a luxurious full-size sedan that had all the bells and whistles. The problem was that nobody bought it. After 3 generations (7 years of production), it was discontinued in North America. I always liked the HID headlights on the 3rd Gen that were inspired by a Gatling gun. Last year, Infiniti lost its mind and decided to rename all its cars. It did this midstream and did not wait for refreshes or renewals. 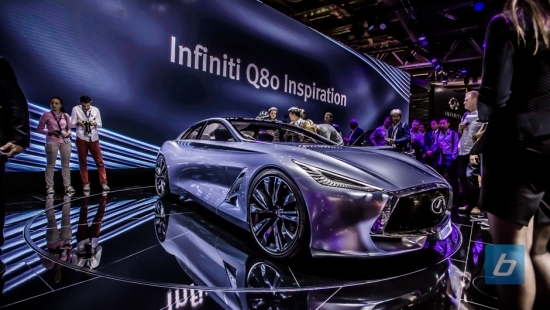 Following this new naming scheme, the Q80 Inspiration concept would suggest that it is going to be the new flagship of the Infiniti line as we reported here. The Q80 is going to be a hybrid that pairs a turbo V6 and electric motivation. This generates 550hp and uses only 5.5L/100km. This efficient drivetrain can run in RWD only or on demand AWD. With our awesome extended summer weather this year, Paul Neider on the forums organized a second exotics charity drive of 2012. Some great cars made it out today, including Paul’s Audi R8 GT. The participants raised nearly $3000 for Habitat for Humanity Sothern Alberta, who helps needy Canadian families invest in affordable housing ownership. Check our our forum for more info on this cause and the charity drive. If you missed out or would like to donate, you can learn more here. Beyond.ca are proud to support this charity, and ran the charity drive in our C63 AMG Black Series. 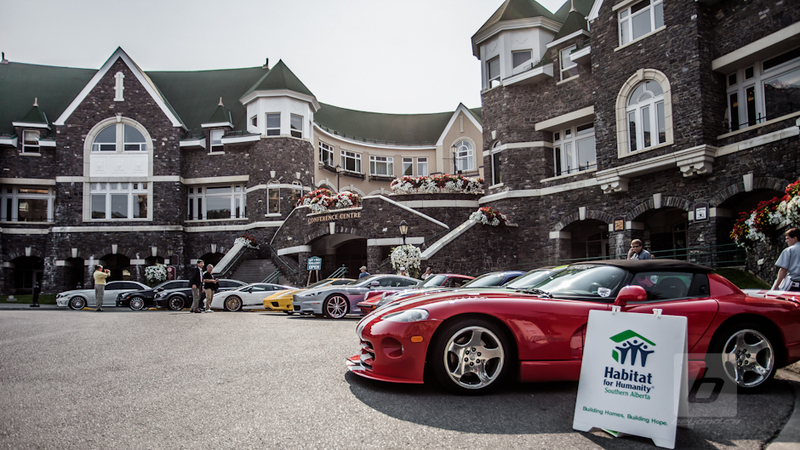 It was quite a sight to see, 20 exotics driving together from Canada Olympic Park up to the Banff Springs Hotel. Check out our full gallery below, and don’t forget to visit the official pictures thread for photos from the other participants. Today wraps up another successful charity cruise for the local luxury and exotics car. This year, our sponsor Jordan Lotoski, put the cruise’s charity efforts towards Kelm’s Kids, who all have Fragile X Syndrome. The participants raised a total of $2500 for the Kelm family. Check our our forum for more info on this cause. Beyond.ca were one of the participants in our C63 AMG Black Series, and was able to shoot some photos inbetween enjoying the cars on the run to Banff. Enjoy, and see you all again at next year’s cruise! Hit the jump to see the full gallery. Since their purchase from Ford by the Indian carmaker Tata, Jaguar’s future has been a bit uncertain, as the luxury automaker was having serious trouble moving cars under the Premier Auto Group umbrella. With Tata at the reigns and cars like the XK selling far fewer units than its BMW or Mercedes counterparts, it seems Jaguar has decided that there is only one way to go – up. In its current inception, Jaguar’s market strategy places it as a British alternative to the luxury offerings of the Germans. 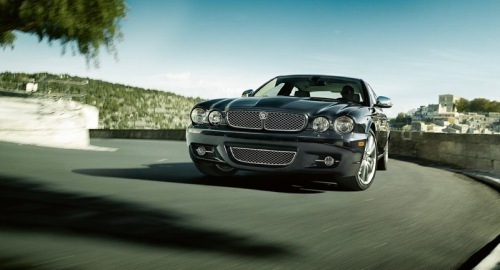 BMW, Mercedes, and Audi have long dominated the segment, with Jaguar left as an old-fashioned niche brand. Even with the more modern look and feel of the XK and XF models, Jaguar still has an image problem, one that goes back as far as the dark days of British Leyland. In an attempt to revive a struggling brand, Jaguar execs have decided that instead of fighting the Germans on the beaches of middle-luxury, they’re aiming for higher ground; specifically, the upmarket offerings of companies such as Bentley. The XJ: Will the next model be ready to take on the Flying Spur? Focuses on the new car are to provide a new range of engines, replacing the supercharged V8’s with more modern engines ready to compete in the horsepower wars. That said, it is expected we’ll see supercharged V8’s replaced with more supercharged V8’s; gone are the days of straight-six Jags. Jaguar’s history of unreliable V12’s may also keep them away from that configuration for the immediate future, and the break from Ford means they no longer have ready access to the Aston powerplants. Luxury appointments will also have to be suitably upgraded to compete with cars such as the Bentley Flying Spur, which carries a hefty price tag in the area of $200,000. So, is the new XJ going to be ready to take on the big names? Find out in 18 months when the big cat is unveiled.